'Aurora's Blush' (Anthony and Dorothy Willott, R. 1993). Seedling 92-169. 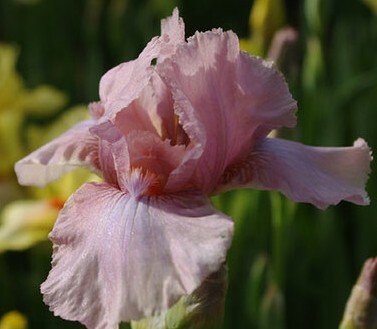 IB, height 25" (63 cm), Early midseason bloom. Lightly ruffled raspberry pink, violet flush at end of beards; beards light coral, tipped light red violet. 'Pastel Delight' X 'Deloris Clark'. Willott 1993. Honorable Mention 1996.
jpg IMG_0960-X2_auroras_blush.jpg manage 179 K 17 Feb 2016 - 01:44 BrockHeilman Please contact Brock Heilman for image use. JPG aurorasblush01.JPG manage 94 K 19 Jul 2015 - 02:26 Main.TLaurin Photo by Don McQueen,London, Ont. Canada Zone5. JPG aurorasblush02.JPG manage 108 K 09 Jun 2014 - 02:16 Main.TLaurin Photo by Don McQueen,London, Ont. Canada Zone5. JPG aurorasblush03.JPG manage 50 K 09 Jun 2014 - 02:18 Main.TLaurin Photo by Don McQueen,London, Ont. Canada Zone5. JPG aurorasblush05.JPG manage 51 K 28 Nov 2014 - 15:18 Main.TLaurin Photo by Don McQueen,London, Ont. Canada Zone5.